The faculty members of the Biology Department are committed to providing the best possible education for our students. Toward this end we strongly encourage students to become full participants in the processes of science. Our role as faculty is to provide the intellectual and physical environment where this participation can take place. 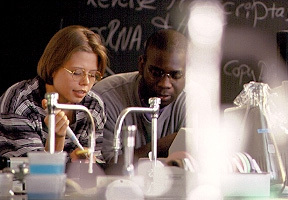 Teaching and learning biology at Hendrix includes rigorous classroom discussions, investigational laboratory exercises, field work, and research projects designed to maximize the role of the students as scientist. We recognize that telling students about science, or even demonstrating scientific experiments, can never provide the rich, rewarding experience of doing science. Although our students do take a rigorous series of formal lecture courses to provide the background necessary for developing an intellectual understanding of science, it is the participation aspects of our program that leads to true maturation as scientists. Our students graduate from Hendrix prepared to enter medical school (Hendrix graduates enjoy a medical school acceptance rate twice the national average), veterinary school, graduate school, the research world, and a variety of other fields.